One of the first things most herbalists learn how to make is a salve. 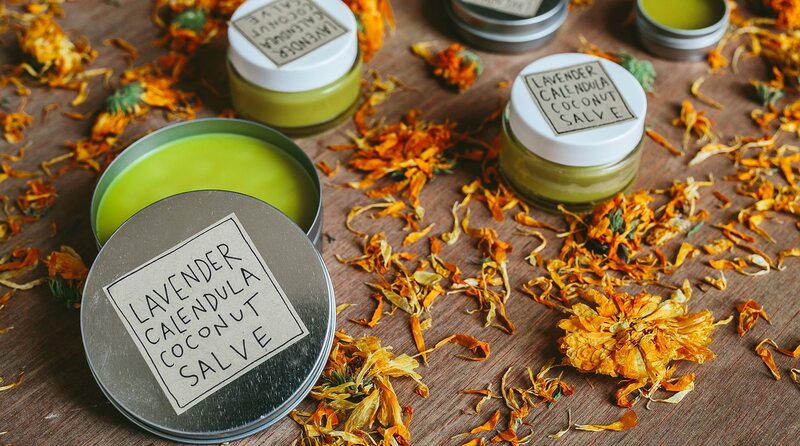 Salves are semi-solid ointments infused with herbs that are traditionally used to nourish dry skin and relieve minor irritations, cuts and bruises. There are many different formulation strategies for salves, which depend on what plants and oils are available as well as the desired effect. We created this simple salve recipe using ingredients that are easily available and affordable. This soothing salve will nourish your dry and chapped skin, and it can even be used as a lip balm. You’ll love its golden color that can be enhanced with a pinch of turmeric powder, a trick we learned from our company’s co-founder, Rosemary Gladstar. This recipe isn’t just pretty. It smells delicious too! The coconut oil adds a sweet smell, and the lavender essential oil adds a nice, relaxing aroma. This soothing salve will nourish your dry and chapped skin, and it can even be used as a lip balm. Add water to the bottom pot of your double boiler, and then pour your calendula oil into the top pot and place above. You can also create a makeshift double boiler if you don’t have one. The main thing is that the oil needs non-direct and even heat to prevent burning. Bring your double boiler to a low heat and grate in your beeswax, and then add in coconut oil. Once everything has melted, add your lavender essential oil and a large pinch of turmeric powder (optional for color). Stir the mixture, and then quickly turn off your burner. Now you can put this mixture into a liquid measuring cup to make pouring your final product easy. Slowly pour into each tin, and allow the salves to cool. *If you want to test the salve before pouring into each container, pour some into a spoon and let it set in the freezer. You can always add more beeswax if you’d like the salve to be firmer. Salves are normally semi-solid and can be stored for a couple years in a cool dark place. Now you’ll have a batch of golden salve full of plant power that you can share with your friends and family. If you’d like to add more herbal medicines to your apothecary, be sure to check out some of our other articles such as Tincture 101 and our Homemade Citrus Spiced Dandelion Bitters recipe.